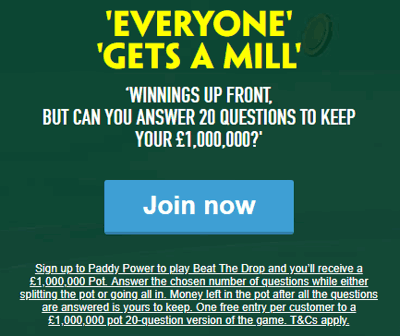 I wonder if you can guess what TV show Paddy Power got their idea for the beat the drop promotion from? The idea here is you start off with your pot of money and then work backwards by answering questions and choosing how much of your pot you risk on each answer. It is kind of like betting in reverse, you start off with the maximum winnings and then choose how much you give away depending on how confident you are of your answers. All customers, new and existing, will get one free go for the biggest pot . This gives you a starting pot of £1,000,000. You then have to answer 20 questions, each round gives you a choice between two questions to answer, as you can see in the examples below. 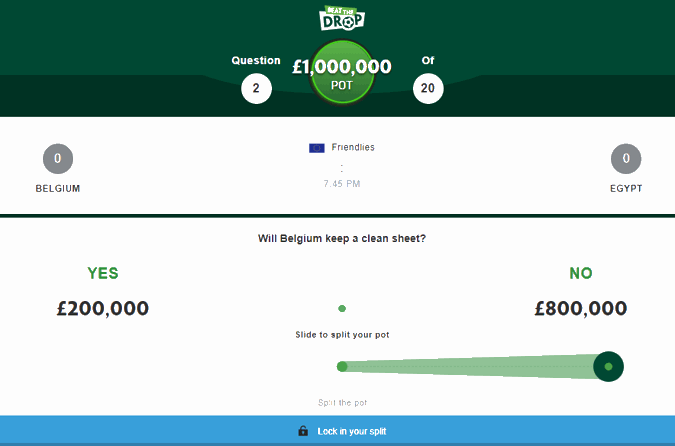 Choose how much of your pot you want to risk on the outcome, this could be the whole £1,000,000 on one answer right down to a £500,000 split on each, depending on how confident you are and how much cash you want to risk. Once the outcome to the first question is known then you will get back the amount you bet on the answer. Using the example in the screenshot I have done a £200,000 split on Belgium to keep a clean sheet vs Egypt, and £800,000 on them not. If they do not concede a goal I get £200,000, if they do I get £800,000, to use on the next question. Note that before you even think about it halving the amount each time will leave you with less than £1 in the end, so it’s not worth the effort just playing the probabilities and halving each time. If you are very confident answering your 20 questions and you get them all right then you’ve bagged yourself a cool £1,000,000 in cash. The liklihood of this happening is very low however so you may want to split your cash a little along the way, especially for questions where you have no strong feeling either way. Once you’ve finished the free game you can now buy tickets to enter again and again if you wish. At this point the game becomes more flexible, you can vary your ticket purchase amount up to a maximum of £250 and the number of questions you want to answer, this effects the top prize money. If you select a £50 ticket and 16 questions the prize will be £1,000,000, depreciating as you reduce the number of questions and/or the stake amount. The lowest ticket and pot amount is £2 with 2 questions, giving a £7 prize. The maximum you can win is £1,000,000 cash and tickets once entered are valid for 60 days, i.e. you have 60 days to complete your questions, obviously you cannot move on to the next question until the last one is settled, otherwise you wouldn’t know how big the pot you had left was. Any cash left at the end of the game is credited to your account as withdrawable funds. Other key terms apply, such as only one game can be played at a time. Make sure you read the key terms before you play the game for the first time. 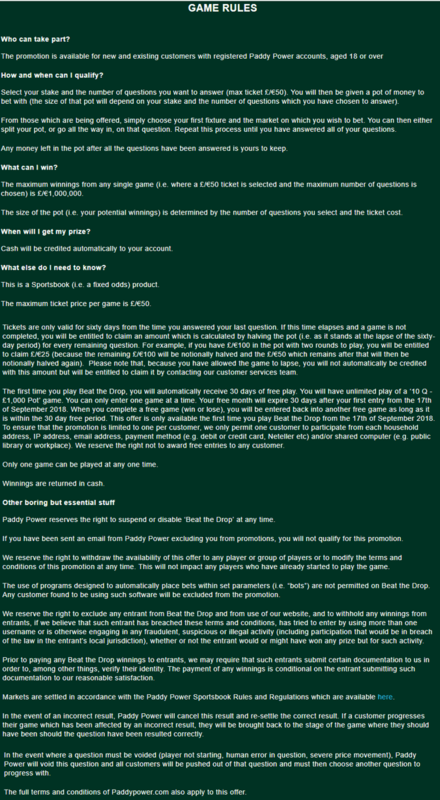 If you don’t have an account you could also claim a welcome offer, read about this in our main Paddy Power review.